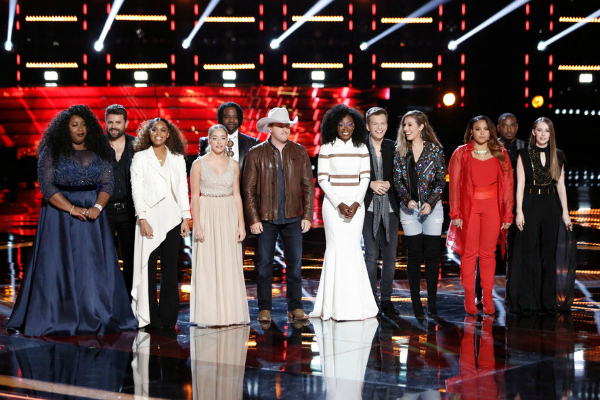 Recovering from last week’s new elimination format, “The Voice” coaches were back to coaching their remaining artists for their Top 12 performances for Monday night’s Live Playoffs show. Adam Levine explained how he determined his final pick last week while being under pressure. The Top 12 artists – Caleb Lee, D.R. 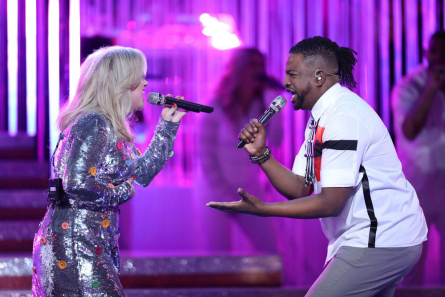 King, Jackie Foster, Brynn Cartelli, Sharane Calister, Kyla Jade, Pryor Baird, Christiana Danielle, Britton Buchanan, Rayshun Lamarr, Jackie Verna, and Spensha Baker all selected songs that were meaningful and had some significance in their lives for their Top 12 Live performances. Rayshun gave another remarkable performance and his coach quickly took notice. Coach Adam predicted that Rayshun just became the front-runner after his Top 12 performance! Coach Kelly loved that Kaleb sounds like the Country she grew-up on. 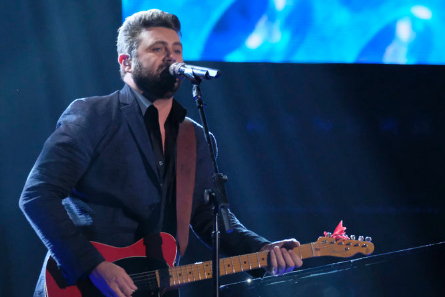 Kaleb sang “Amazed” by Lonestar On his performance, Kelly told him, “I would rather hear an emotional singer be pitchy a little bit.” Blake, who used to have Kaleb on his team, said he felt “regrettful a little bit” after watching his performance. Jackie chose Britney Spears’ “Toxic” song” which she said is “just daring.” Her band played it and she dedicated the song to her band. Jackie said she’s addicted to bad boys, and that’s what “Toxic” is. Alicia described Jackie’s vibe as being a mix of Pink and No Doubt, and could see her as a leather clad Pat Benatar which is how Jackie was styled for her performance. Spensha chose one of her favorite singers of all time- Trisha Yearwood’s “Down on My Knees.” She said it’s a huge song by one of the most iconic Country singers ever. Spensha said she’s thankful to be singing songs that mean something. When she heard Country music and started “balling,” that’s when she knew that’s what she wanted to do. Christiana said “fear has an ongoing nuisance” in her singing. She said there’s no more fear. Christiana chose to sing “Say Something” by A Great Big World. Kelly told Christiana that “the low tones in your voice are so magical.” and so beautiful and felt “blessed” to be there to listen to her. Alicia said Christiana keeps showing them all these dimensions to her and there’s no one else that sounds like her. D.R.said because of music he was able to get out of his bad neighborhood growing up and experience the world. Kelly predicted that if D.R. masters this song, “he’s unstopable.” D.R. sang “White Flag” by Dido. Blake reacted “there’s so many different sounds to your voice. So many different layers to what you’re capable of doing and explores that on stage. Blake called D.R. “incredible.” Coach Kelly said D.R. is such an amazing vocalist and wants to hear the record he’s going to make. Adam stole Sharane, then America voted her to the Top 12. She was stunned by it all. She chose “In My Blood” by Shawn Mendes whom she worked with. Her former coach Alicia said there’s something special about her. She has a power and sadness to her. Coach Adam said it’s hard sometimes to figure out what leads to success. 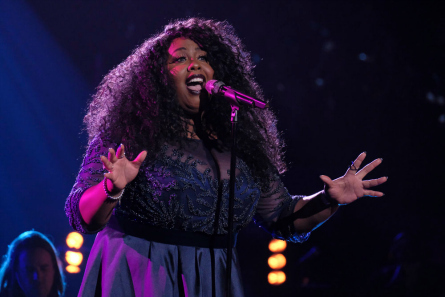 Sharane has the ability that she’s telling the truth when singing and has the ability to get the audience to come with her on her journey. Brynn was the first member on Kelly’s team to get voted through to the Top 12. Brynn chose “Up to the Mountain” by Patty Griffin dedicatd to her mom and everyone who supports her in her journey. Alicia told Brynn that she’s proud of her for not “quitting her day dream” and so interested in learning more about who Brynn is. Coach Kelly reacted that she’s constantly shocked. Brynn goes from Rascal Flatts to Patty Griffin and called it the craziest eclectic of all the music and she nails it. Adam heard an Avril Lavigne song “I’m with You” and wanted to hear Jackie sing it. It was how he chose her last week to round out his team. Jackie said the song is about being alone and lost and she’s felt that way before. Adam pointed-out that past season three winner Cassadee Pope sang the song and did very well. Blake, who coached Pope, said about Jackie that it was cool to mention Cassadee. But, Jackie’s voice is completely different and she does come at that Country angle. He added that she’s so direct and “a great singer.” Adam said he was forced to make this crazy quick decision and he chose Jackie. Its becuse her growth has been so amazing. “That’s a hard song to produce live” Adam added. Kyla chose “One Night Only” by Jennifer Hudson. Blake said Kyla is America’s number one choice for his Team when she got voted through first last week. Kyla was really nervous about singing this song because she used to sing back-up for Jennifer Hudson. During a Facetime phone call with Kyla, Jennifer Hudson told Kayla that “J Hud” will be cheering her on. 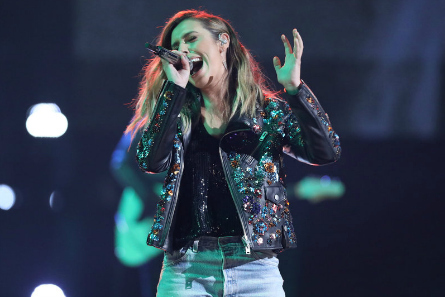 “The Voice” host Carson Daly announced at the top of the show that Team Alicia’s Britton was the most downloaded artist from Monday night’s Live Playoffs show. The first artist saved of the night was indeed Britton Buchanan (Team Alicia). The next artist announced as saved was Team Kelly’s Brynn Cartelli. 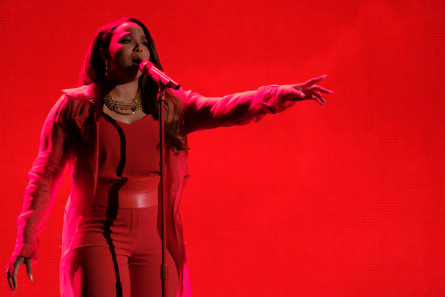 America also saved Team Adam’s Sharane Calister. 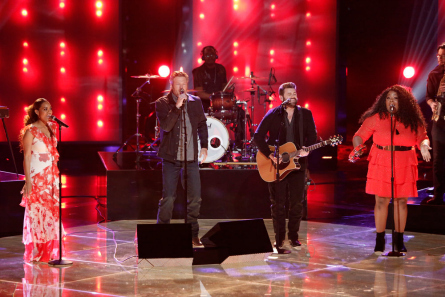 Next, Daly announced the next artists saved as: Pryor Baird from Team Blake, Christiana Danielle from Team Alicia. 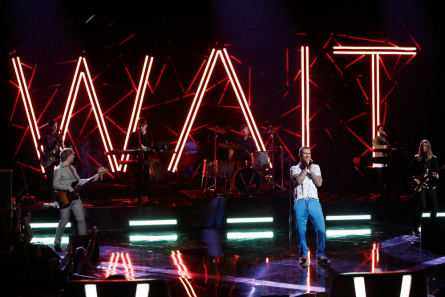 The remaining seven artists came out onto “The Voice” stage. Rayshun Lamarr said just having Adam helping to make him better, he is grateful for. Kyla was asked what it would mean to be saved this week. Kyla said she’s honored and is enjoying the process. “To be in the next stage of it, means I have another opportunity to grow and stretch,” stated Kyla. 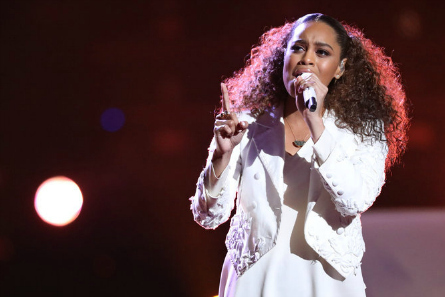 From Team Blake, Spensha Baker was saved. Then, the next artist saved was Kaleb Lee from Team Kelly. After the cast of TV show “Rise” gave an impressive performance (they really can SING), Team Blake performed “I Thank You” by Sam & Dave. Jackie Verna said she’s humble that Adam kept her on the show for so long. 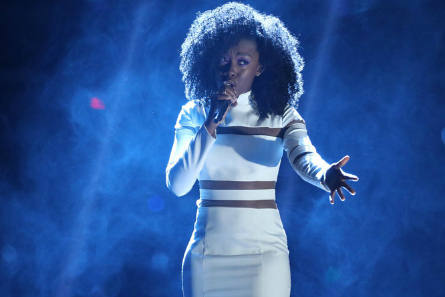 Carson Daly announced that America saved Jackie Verna, and Kyla Jade from Team Blake. That meant all of Team Blake was saved! Jackie Foster (Team Alicia) was also saved. Team Alicia was also ALL saved! THE BOTTOM TWO: Rayshun Lamarr and J.R. King. D.R. King sang “Papa was a Rolling Stone” for his save song. Rayshun sang “I Can’t Stand the Rain” for his save song. Coach Adam said because the Lives just started, he’s giving America a pass. 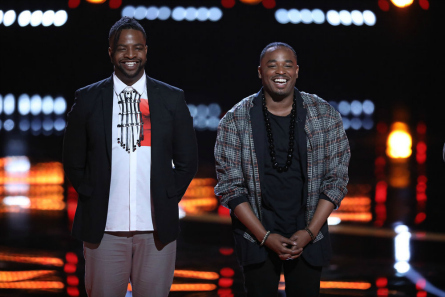 But, is sure Rayshun will stay after that performance because he’s one of the best performers on “The Voice” this season. According to the Instant Save poll, 37% of the votes went to D.R. King, and 63% to Rayshun Lamarr. Adam was confident that Rayshun was going through and told him to stop saying his goodbyes because he’ll be there next week. The Instant Save vote went to Rayshun Lamarr who moved-on to the Top 11 next week.